Choosing a medical waste disposal company can be tricky if you’re not sure what to look for. If you’re a busy doctor’s office or hospital you might be tempted to just pick the first company that appears in your Google search results. After all, what’s the difference—they all do essentially the same job, right? You just want to get rid of your biohazardous waste quickly, safely and with as few headaches as possible so you can get back to the rest of your work. The good news is that the medical waste management business is growing, which means consumers have more choice of services. According to RNR Market Research, there are several factors contributing to this growth, including more medical waste regulation and an aging Baby Boomer population requiring more health services and procedures, which in turn incurs larger amounts of medical waste. This is good news for consumers because it means there are more options in medical waste disposal companies. But having lots of options can be confusing, especially if you’re not clear on what differentiates one company from another. When it comes to choosing a medical waste disposal company, instead of flying blind take a minute to get informed on the key factors to look for and the questions to ask when searching for a service. Spending a few minutes of research now means that you won’t have to revisit the same decision six months later, when it turns out the company you picked isn’t meeting your needs or fully complying with your state’s regulations. If you’re like most people, you don’t want to be tied down to one provider until you’ve had a chance to see if you’re a good fit and if you’re happy with the company’s services for the price. Look for a medical waste disposal company that offers a contract-free grace period so you can try them out first. Customer loyalty has to be earned. Any company that doesn’t offer a no-commitment trial might not be confident in it’s ability to keep you as a customer. 2. Will your annual service rates go up unexpectedly? No one likes negative surprises, but some companies may try to impose hidden fees and service charges. One medical waste disposal company in Tennessee was sued for regularly raising its rates even though it promised only to do so under “limited conditions.” Make sure there isn’t any fine print in your bill or contract. 3. Is the company fully compliant with federal and state regulations for medical waste disposal? You might assume this is a given for any medical waste management company, but regulations differ from state to state and are subject to change. You want to make sure the company you choose understands all the regulations and is keeping up-to-date with new rules as they arise. 4. Does the company offer a variety of materials and receptacles to suit your waste management needs? A small clinic is going to have different needs than a city hospital. 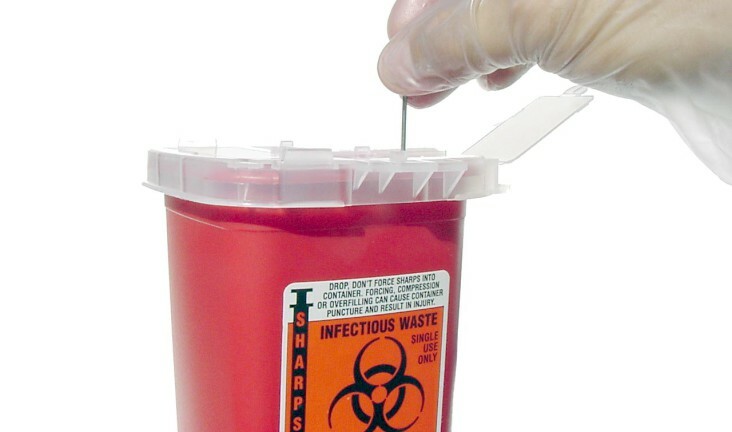 Make sure the medical waste disposal company you choose offers a variety of sizes of tubs, barrels and containers for your use, as well as complementary red biohazard bags, liners and boxes. 5. Does the company make regular and/or frequent pickups? No hospital staff member wants to see medical waste just sitting around, even if it’s in a sealed receptacle. A good medical waste management company will make regular pickups so your waste is gotten rid of quickly and efficiently! 6. Can you reliably reach someone in customer service if you have questions, especially about what to dispose of and where? It may not be immediately obvious what waste can go in your waste receptacles and no one should expect you to have to guess! For instance, a sharps container is usually thought of as a receptacle for needles syringes but it can actually hold all medical waste materials that have the ability to puncture skin. On the other hand, standard office supplies and household items should never be thrown in your red biohazard bags. If you’re unsure of what you can dispose safely and where, it helps to have access to a quality customer service team who can answer your questions and are there when you need them. Knowing the right things to look for in a waste management company will help you make the right decision the first time. It’s a good feeling when you know you can count on your service provider to be honest, professional and compliant. Medical Disposal Not Working Out?